You want book covers? Here’s one. Yum. I love the expression on Sieh’s face, mingling sorrow and hope. (Or so I have decided.) I love the rich redness of the hood. And yeah, he’s paler than I imagine, but still — I love the whole atmosphere of this. ::happysigh:: So, German readers, you’ve got a treat coming! And thanks to all of you for your support so far! I’m confused. 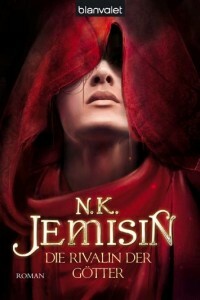 Book 2’s cover is representative of Oree? Now I know I got Yeine wrong, but…was Oree fair-skinned? And what’s up with Blanvalet and all these hoods? And the hoods — I don’t mind them, because I don’t expect a totally literal representation. Sends a clear “this is fantasy” message, and it’s better than a guy with Mighty Thews(tm) axing a bear. Not much different from the current obsession with hoods on this side of the pond, IMO. Yeah the “lovely cover” is what I was referring to. She actually reminds me of my friend’s sister, who is half Black and half German, but I was pretty sure that Oree was dark-skinned. I also really don’t like that “symbolism” argument; it sounds like an excuse to me. I mean, really, WTF is the point of putting a random person on the cover, when the book has a ton of people to represent it? And what exactly is the random white person (in the case of THTK) symbolizing, anyway? Well, I have seen some truly WTF foreign covers of fantasy novels, and there’s some truth in the fact that in many countries something generically fantastic (or generically science fictional) gets used on the covers. I’ve seen other authors raging about the fact that spaceships get stuck on their sci-fi novels in which no spaceship appears, for example. And I’ve definitely seen a few fantasy covers with random Mighty Thews. So that part of it is part and parcel of the foreign-publication game. The fact that the random fantasy image tends to be white is, of course, the root of my initial objection. 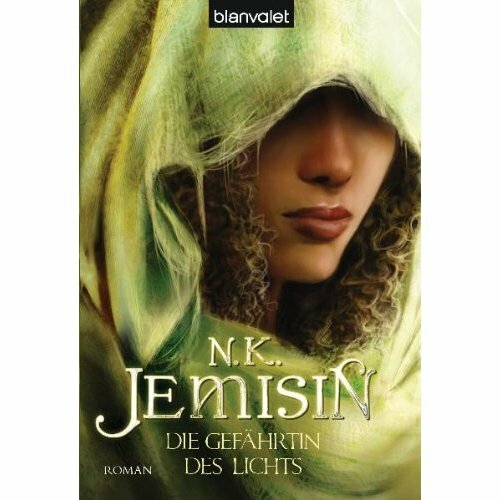 Regarding the covers: Using hooded women on fantasy covers is a huge trend here in Germany at the moment. When I go to the fantasy corner of a book store pretty much all I see on covers is hooded women. It’s getting a bit ridiculous actually. If I remember right it all started with Trudi Canavan’s books which covers had this theme going on. I suppose since they were successful enough everyone else wants a slice of the hooded cake, too? There’s at least one other big trend going on that is perpetuated by at least 2 publishers: Big sagas about The Elves, The Orcs, The [insert generic fantasy race/species here] with all books having covers that depict one big iconic/clichéd weapon stuck in the ground. The covers are pretty and all but the inflated use of that theme is kinda irritating. The cover theme suggest that those books kinda belong together – but as far as I know the stories about the different races/species aren’t even located in the same fantasy universe. So it’s probably just a marketing trick that suggests “you gotta catch ’em all!” Something similar is probably going on with the hooded women theme. Yeah, I’m a little tired of the hoods, too — but they seem to be a trend in N. American/European stuff in general, because gods know they’re all over covers here in the US, and I saw plenty when I visited the UK last year. Though here, they seem to have become synonymous with/symbolic of “gritty fantasy” a la Brent Weeks and Joe Abercrombie; I hardly ever see them on stuff with female protags. I suspect it’s just that hoods allow a degree of projection — like the way heads get partially cut off on romance novels, or characters’ backs face the viewer on urban fantasy. The reader somehow transfers him/herself into the character, identifies with the image, or something vaguely Freudian like that. I dunno. But I never expect or really want 100% precise representations of my characters on book covers; they’ll never look like the people in my head. I prefer something impressionistic — suggestive of mood and theme, enticing to the eye, not jarring to the mind. A white character on a book with a black protagonist jars, in part because of all the historical baggage associated with such misrepresentations. A middle-toned black woman instead of a dark-skinned black woman? Doesn’t jar me, but I can see why it might jar others. A woman in a hood, when the protag is a woman and actually does wear a hood for like a minute (Oree)? Eh, that’s fine in my book. Sieh and Yeine never wear hoods, but in this case I interpret the hoods impressionistically — they’re In the Dark! There’s a Mystery! Etc. As far as I can see this theme is used here predominantly on fantasy novels with female protagonists – so seeing lots of these floating around in book stores is probably a good sign for the genre. I always loved reading about female protagonists cause every so often the default is still male. Very exciting :D I am going to buy the book the day it’s available in the nearest store.